1. Birth-terms. Birth, Birth, Birth. Instead of referring to a child's "real" mother, the appropriate term is "Birthmother". Both moms are real, right? One gave birth and the other is doing the rearing. Birthparents also often like to be referred to as, "First Parents" and this is acceptable too. We even have some friends who like to be called "Belly Moms". Once the Birthmother signs the papers relinquishing her rights, the "Hopeful Adoptive Mom" becomes "Adoptive Mom" or preferably just "Mom". If you are friends with the BirthFamily- you may want to ask them what they would like you to refer to the Adoptive Parents as. Actually this can apply when describing all adoption-related family members, unless you know them by first name. It's always a safe question to ask. 3. Biological Child. This one is probably the most common in my life, and again - it does not upset me - I'm just trying to encourage appropriate word usage. "Do you want to have a child of your own?" I always say, "You mean a biological child?" My adopted child is my own, but I get the question that is being asked. Let's make another mental note with this one, I believe it's 75% safer to assume that people choose adoption as a "last resort" in growing their family. Not everyone is like me and the rarer few who chose it before fertility treatments.. So, asking about a hypothetical future biological child will likely just strum up the kind of emotions that you do not intend to by asking that question. It's pretty safe to stay away from that one, unless you want to discuss fertility and miscarriage, then by all means- discuss that. I'd lead with a different question though. 4. Expectant Mother. A Birthmother remains titled an Expectant Mother until she signs the parental-relinquishment papers. Typically these papers are signed once she is realeased from the hospital - about a few days post birth. 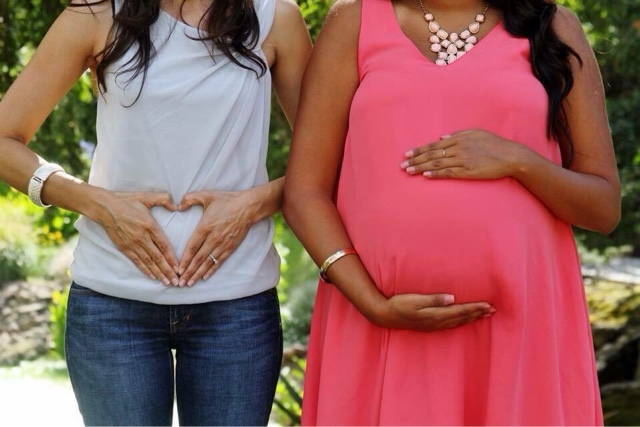 An adoptive mom may be talking for months with her potential child's expectant mother, hoping that one day she becomes their child's birthmother. Pretty simple, yeah? 5. Placement. You may have seen a viral video going around of a "placement ceremony". I had never seen anything like it, but apparently it's not too uncommon in some states. I got a little flack on my ignorant comment that I thought it "seems like something you'd do in a closed-adoption?" (Yikes! Hey, I'm still learning.). Actually some Birthmothers love that their child's parents receive a ceremony like this. Placement can happen at any time and differs in each adoption process. It is when the Adoptive Parents take the baby Home or into their custody. This time can vary from, as soon as baby is discharged from hospital - up to a few weeks post-birth. 6. Being Triad conscious in Open Adoption. This isn't really a term, but I felt it was necessary to include. It's most important to be conscious of everyone in the triad, which is the Birthparents, Adoptive Parents, and Adoptee. Most importantly the Adoptees. Like any parent, we are always wanting the best for our child. When applying this logic to adoption it just looks a little different. When you dive into researching Adoption the evidence is overwhelming that Healthy Open-Adoptions are most beneficial to the Adoptee. Makes sense, right? Never having to question where you came from? Or Wondering who's eyes and nose you have?? Parenting in the triad will differ in each adoption. Some Birthmothers live with their biological child and his/her parents. Some get pictures once a week, some get visits once a year. There are many degrees of "open" and there's no right or wrong. Open adoption typically is any adoption where Birthparents identity and medical records are present. In most cases there are no legal contracts bindibb the adoptive family as to just how open they shall remain, it's basically left to the honor system. Some states carry a 310-contact agreement. However, if a birthmom can't financially keep the agreement in current legal standings, she hold no legal grounds. I find it heartbreaking when my friends, that are healthy Birthmothers, are cut-off from their biological child's life because "open adoption" doesn't fit into their lifestyle anymore. I wrote a letter to myself the day we took our baby home, I often re-read it to remind myself how grateful I am for the Birthparents who chose us. They handpicked us and placed their baby into our arms. They made our family complete and for that we are eternally grateful. My husband and I grew our family through the Adoption Process. There is SO MUCH to learn, and I have to say I'm so proud of our family and friends who use all of these terms appropriately. If you have a friend that is a member of the triad, I bet they will be pleasantly surprised if you appropriately use any of our suggested words...try it!